It’s been a crazy busy Halloween weekend. Friday after work we got supplies for Halloween and got ready to run the Screaming Pumpkin Marathon. This course is hilly 6.55 mile loop through a cemetery that has rocky, broken up path. The course opened at 6pm and you could start the course anytime and try to finish as close to midnight as possible. Rob and I arrived at 8pm, figuring an easy pace will bring a 4 hour-ish marathon with some time cushion for the grinding hills on my recovering hamstring. Dressed and ready to roll. I went with adidas Bostons for more support, capris, long sleeved shirt, Boston jacket, gloves, hat, head lamp, glow stick, glow stick necklace, and headlamp. It was in the 40s when we started, but I get cold easily so I opted to over dress. This turned out to be a good idea because around 11pm the temps dropped into the 30s, a light drizzle and light breeze started. This race is mostly folks doing a relay so there was a lot of bonfires and tailgating as people waiting for their runner to return. 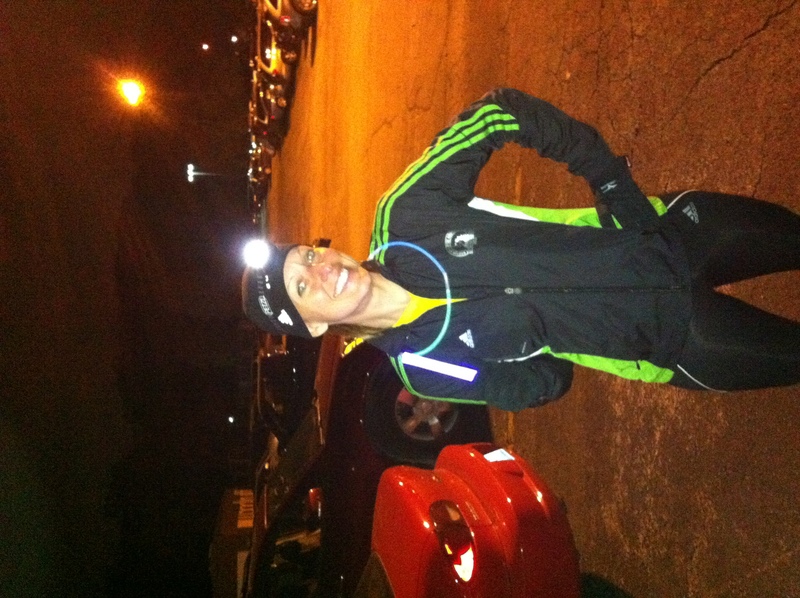 Rob and I got started and immediately noticed that glow stick necklaces and running don’t mix. After they bounced around and hit us in the chin repeatedly we had them off within .25 miles. The course is unlit and very dark. The direction is marked by glow sticks lining the way, keep the glow sticks on your right and you are heading the correct way. I have to say that running in the pitch black with only glow sticks light the way was a very cool look. Since the course is very hilly you would see handfuls of runner lights bouncing up and down the cemetery at different points in the distance. Such a cool thing to see. We had no timing devices, but we are familiar with this course from the half marathon and there are some parts of the road spray painted with mile markers. So it was amazing to see how the miles seemed to quickly pass by. The road was very uneven and rock in parts, which is hard to manage in the dark. They had marked as much of the course as they could with red glow sticks to note places to avoid, but Rob and I found some locations they missed. We each tripped a handful of times pretty hard, luckily neither of us falling to the ground. The bad part was the tripping would cause my leg to pull back funny, upsetting my hamstrings but at least I never face planted. We were back to the chip mat at 6.55 Miles and time felt like it was flying by because we were so entertained by the course. We were running very easy and were able to just pass the time chatting. On our way back into the cemetery and up to the first hill the coolest/scariest thing was a very large deer passed right in front of us. It was freaky cool to see this large dark mass pass right in front of us because it was scary at first to try and figure out what it was in that split second. This would be a good time to mention that our headlamps may be decent enough for our street lit neighborhood, they were not match for the complete darkness of this run. The light was just soaked up in the darkness and the headlamps were really more for identifying us to other runners than lighting our path, which made tripping all the more likely. I had no idea that our headlamps weren’t the best until we saw examples of other runners who had heavy duty lights. IF there is ever a true night race that we run again, we will need better headlamps and perhaps little flashlights. Into the next set of hills around mile 8-ish Rob had a very bad trip that rolled his ankle and made a popping sound. He was stopped instantly and assessed the situation. We walked a bit and it was hurting badly. He wanted to continue, but now his ankle would be in pain the rest of the way. We slowed our pace and stopped anytime the pain was too much. My hamstrings weren’t loving all of the hills either so taking it easy was fine by me. The second loop, even with the injury stop somehow felt like time went by faster. Into the third loop of the course and the temperatures drop. Rob feels like his ankle is swelling and he is tolerating the tightness and pain. We are only around mile 15, so much more to go. We start to question if it’s worth it since we were out just for the fun. The fun was quickly fading. Back for our final lap, time passing slowly since we are taking it super easy. 19.55 miles and back out we go. However Rob’s ankle is hurting even on the flat portion of the course. Around mile 20 or 21-ish and we start weighing if it’s worth tackling the hills again. His ankle is so sore that we could get into the deepest part of the course realize he can’t go on and not make it back in time, are we willing to take that risk. Rob would do it for me, but it just wasn’t worth it. We decided to bag it and walked the mile back to turn in our chips. We made the right call. As we were walking back Rob’s ankle began hurting worse that walking was a challenge, there was no way more hills would have helped. We are happy that we did get to have a hilly long run at night. However it wasn’t worth Rob’s ankle injury or the risk of falling multiple times. I think we will stick to this course in the daylight. If we ever do another really dark race we will make sure that we have better lights and that the path is more paved than rock. We headed home to finally have dinner and weren’t in bed until after 2am, what a long day! Saturday was a lot of Rob icing his ankle and then we joined ORRT to help with a local 5K. Me faux running through the finish chute. Yeah I’m easily distracted from my duties. 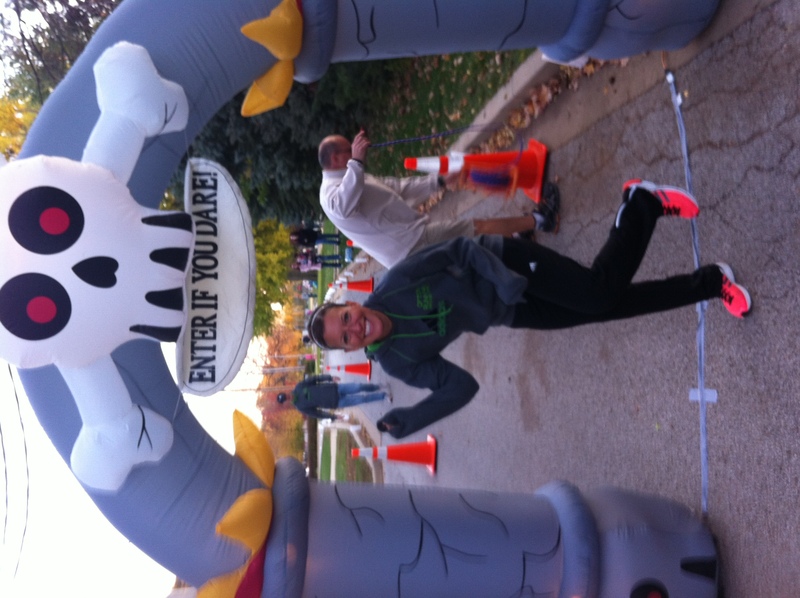 The kids run was an obstacle course and we got to pass out candy and prizes. Then for the 5K we managed the finish chute and announced awards. Afterward we headed home so Rob could get back to icing his ankle. The swelling has reduced so I hope a few more days of rest and ice will get him back to new again. Ha that is too funny and sounds adorable. I would have had those glowsticks off immediately too. Good heavens! Sorry to hear about Rob’s injury. I hope he heals soon. 😦 At least you got a good LR in! I have had luck with glow stick bracelets, but not the necklaces. You guys made the right decision not to finish the race. Sorry to hear about Rob’s ankle. I hope he heals quickly. Sounds like a very fun and interesting event though! !